【 A Brave Warrior 】　After the withdrawal from the Naval treaties, plans were laid to build Kagero-class warships. The Yukikaze was the 8th completed destroyer built of the Kagero-class in January 1940. The Yukikaze saw fierce action at Midway, Guadalcanal, Mariana Islands, Leyte Gulf, as well as serving in other battles throughout the Pacific Theater. Furthermore, she also served as a patrol ship and assisted in transportation duties. 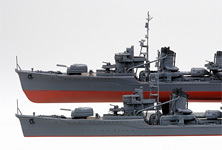 At the time of her completion, she initially came armed with three dual 12.7cm gun turrets and two quadruple 61cm torpedo launchers, but in the latter stages of the War, her armament was strengthened with a compliment of AA guns as well as radar changing her beautiful silhouette into one of ferociousness. Even at the Ten-Ichi-Go operation in April 1945 where she fought hard alongside with the doomed Yamato, she was able to save many survivors and return safely to port. The Yukikaze survived WWII relatively undamaged she was therefore named“the Lucky Destroyer”. After the war, she was used to ferry Japanese soldiers and personnel back to Japan. Later, she was transferred to the Republic of China for war reparation and served with distinction throughout the 1960's. 【 About the Yukikaze 】　Standard displacement: 2,000 tons, Length: 118.5m, Beam: 10.8m, Output: 52,000HP, Speed: 35.5 knots, Armament: (At the Ten-Ichi-Go operation): Two Twin 12.7cm guns, Five triple 25mm AA guns, Fourteen 25mm AA guns, Two 13mm AA guns, and Two quadruple 61cm torpedo launchers. After assembly, the turrets are moveable. Choose to have your guns at rest or ready for oncoming aircraft. Metal parts depict anchor chain. 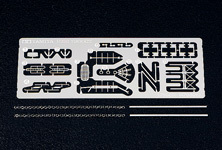 Transparent parts for bridge windows and searchlight lenses included. The precise mold of the superstructure provides a realistic finish. 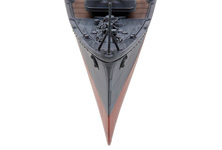 Durable ABS resin parts for front and rear masts and flagpole. Jig for assembling the tripod mast included. The destroyer's sharp bow is faithfully reproduced allowing you to see its impressive 35.5 knot capability. You will get much enjoyment from exhibiting either a full hull or a waterline display of the Yukikaze. Included photo-etched parts for the radar, AA gun shields, ladders and propeller guards enhance realism. 【 About the Model 】　From the beginning through to the end of the Pacific hostilities, the Yukikaze had an impressive naval record. This is a 1/350 scale plastic model of “the Lucky Destroyer” which fought at the Ten-Ichi-Go operation in April 1945. ●Length: 338mm, Width: 31mm. 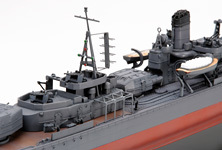 The added AA guns and radar give the Yukikaze a fierce presence. ●The ship's hull is separated into left and right parts. 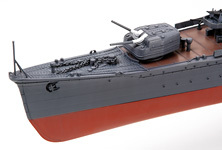 The ship's riveted side plates and degaussing cables have been reproduced with great detail. 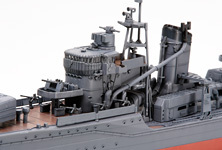 ●Metal parts depicting the anchor chain and propellers add realism to the model. ●Machine gun parts feature a laser processing for a sharper, more realistic finish. ●Polycaps allow the main turrets and torpedo tubes to freely rotate. ●A display stand is included allowing you to show your wonderful full hull exhibit. ●After completion, you are able to store your model in its special packaging.